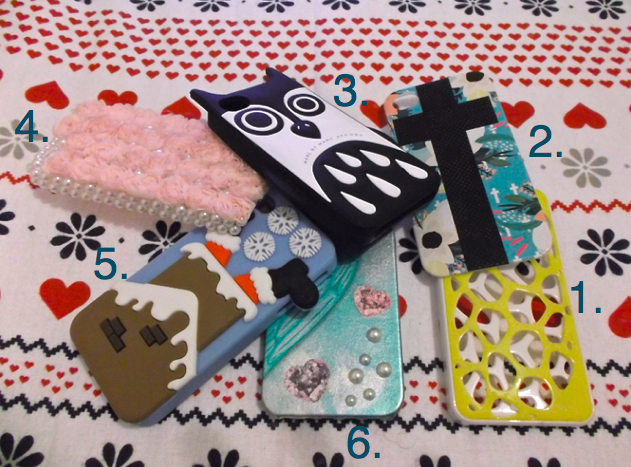 Jesska Denise: Dress Up Your Iphone. I recently bought an iphone which means I recently bought a hell of a lot of Iphone covers which I don't need but really needed all at the same time. My main reasoning behind buying an Iphone to begin with was all the awesome covers you can get. Ebay is a sea of incredible covers and I nearly drowned in a flood of potential covers to buy. I settled on four. How could I not. They're so cool. I especially love the roses and pearl one. I have a soft spot in my heart for all things tacky. The tackier the iphone cover the better in my opinion. I figured I would share with you guys all my great finds cause who doesn't like a good bargain? 1. The Birds Nest - If any of you are "Pretty Little Liars" fans you'll recognize the yellow birds nest as a good copy of the pink one that Hanna Marin has throughout the PLL seasons. Not to forget Miss Serena Van Der Woodsen who I also spotted rocking a black one on my personal fave "Gossip Girl". If its chic enough for an Upper East Sider well then it's good enough for me. I bought mine from here on Ebay but a quick search and you can find it in numerous different colours and prices. 2. I'm a sucker for anything with a cross on it and after seeing pics of Miley Cyrus and Kylie Jenner showing off their studded 'Wildflower' ones a few months back I knew I had to have one. The 'Wildflower' ones are a little pricey (35$) so I headed back to good aul Ebay and found this one for cheap as chips here. 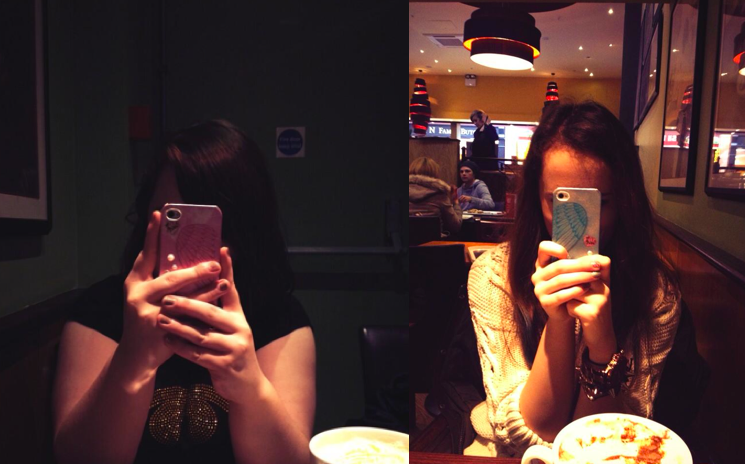 A good cross Iphone cover is the ultimate mirrored selfie companion, didn't you know? 3. I LOVE owls (not as much as Megan from 'Blondes Love Cupcakes' mind you) and after seeing this Marc by Marc Jacobs knock off I knew it had to have it for my Iphone. I'd been lusting over the cases on the Marc Jacobs site but at 48$ it's a little much for a basic silicone case. Even if it does have cute little pointy ears. I picked mine up on Ebay (oh lord) here for 5$. I'll let you all in on a little secret - I really wanted the dog one but it wouldn't ship to Ireland. Oh #firstworldproblems. But I'm really diggin' the owl. It's managed to stay on my Iphone the longest out of the lot. 4. I really love this one Kylie Jenner has in one of her insta pics but for the life of me I couldn't find a good cheap version online. So I settled for this pink rose one with little pearls (Ebay here). Its the right amount of cute and tacky. The roses get in the way of the camera a bit though so I have to try fix that. Can't be snapchatting with something in my lense. If you're a Kendall and Kylie Jenner fan check out my pinterest board here. 5. It's Christmas, therefore everyone needs a Christmas inspired Iphone case. I got this silicone one in Penneys for 4€ about two weeks ago and I love it. The little dangling Santa Claus feet are hilarious. As for this gif? I'm sorry, I just HAD to include it. My Iphone is an Iphone 4s which I got a pretty good deal on in Vodafone. All the Ebay cases were ordered on a Saturday night three weeks ago and all had arrived by Tuesday last week. Impressive really as two were out of the EU. A huge shop full on i-phone covers has just opened up near me, so I'm hoping someone will have got my hints and grabbed me a couple for Christmas! Some gorgeous vintage florals, which are just my cup of tea. You've got quite the collection there!